These are the ‘NEW’ beautiful Cosmic Diamond Starlight necklaces…. 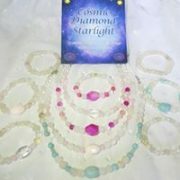 they match each of the bracelets and contain the same powerful crystals. Details : The necklace length is 17 inches including the clasp. If you own a bracelet already and would like to purchase the bracelet or necklace without the cd please deduct £5.00. * Pink Mangano Calcite bracelet and necklace connects to Commander Ashtar and contains Satyaloka (Azeztulite) and Rose Quartz. 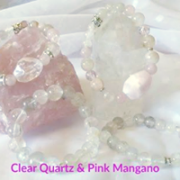 * Clear Quartz bracelet and necklace connects to Master Marko and contains Satyaloka (Azeztulite) and Rose Quartz. 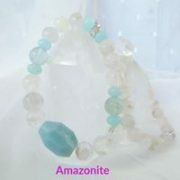 * Green Amazonite bracelet and necklace connects to Lord Hilarion and contains Satyaloka (Azeztulite), green fluorite and jade. * Fuschia Agate bracelet and necklace connects you to your own personal Intergalactic Master. ALL 4 bracelets come with a second bracelet of Satyaloka Quartz (Azeztulite). * Satyaloka carries the energy of Spiritual Beings from higher dimensions known as the AZEZ and contains currents of higher light.. The CD was recorded live at a Sacred Site, which is a Powerful Galactic Portal in the North West of England. The CD combines Rosemary’s voice and powerful high frequency crystal bowls and harp.